Now you know what you need"
Or you can come later"
"Pin cushion prick fix this poor bad dreamer"
Or if you come on later?" Or you're going to come later"
so many wonderful souls, many famous, but most unknown to all but those of us who love them - down the dark ladder. such a beautiful, chilling, and haunting song. i love it as much now as i did then. I'd like to be the first to comment upon the quality of the poetry in some of these lyrics. 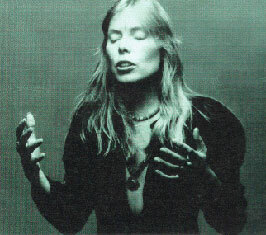 When I was young I listened to Joans' albums thousands of times.As a matter of fact, when we were sweet sixteen (and Joni was 17) we all sang in the same coffee house at the Y in Toronto! I remember being electrified by "Sang the Corow on the Cradle"! Some of this poetry is wonderful. The music is beyond superlatives, and this site is very well put together. Thanks for publishing the lyrics, I was too busy dancing,working, or minding my kid to learn them all, or to see the sound studies behind the scores. Way, Joan!